Poor, handsome Charles. That DILF is having a pretty rotten birthday. And no, it’s not because Diana realizes that her feelings for Richard might be much stronger than she let on, and she’s tired of primping and preening for Charles’s approval. I believe her exact words are that she’s “shutting down this power plant.” Instead of finding Charles the perfect gift — or, rather, having Liza find him the perfect gift — she decides he’s “getting a goddamn cupcake like everyone else.” I’m sure that Diana thinks getting a cupcake is a travesty beyond repair, but cupcakes are delicious and Charles isn’t a birthday guy anyway, so he probably won’t even notice. Scratch that, there is NO way Charles feels one way or another about a cupcake because his entire life has blown up in his face thanks to Liza and Kelsey. Those ladies are nothing but trouble, I tell ya! 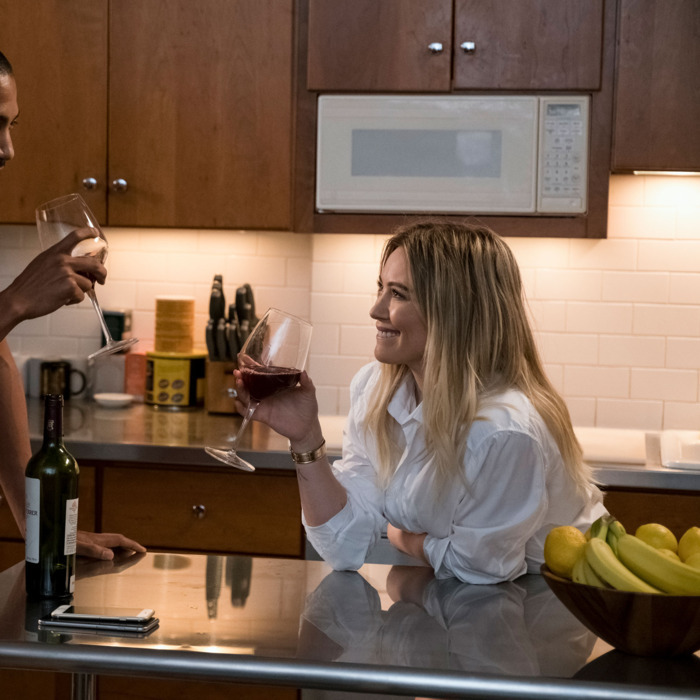 Before we get into this week’s episode of Younger — THERE IS SO MUCH TO GET INTO — let it be noted that while all the drama goes down, Maggie is over in Brooklyn in a hilarious story line about dating a gallery owner who is rocking a mustache. It ends with the two ladies in a bathtub and Maggie mistaking Donna’s offer to let Maggie shave her as the opportunity to get rid of the ’stache. Donna meant shaving, um, another part of her body. It’s a short bath. Across the bridge in Manhattan, Liza is having dinner with Caitlin. It’s all cool and fun until who should walk down the street but … Jay. You know, the guy who wanted to poach Liza from Empirical during the Bonfire retreat. Sure, it’s fun to watch Liza squirm (Sutton Foster is a master of physical comedy) as she tries to send Jay on his way, but this run-in could have serious consequences. Caitlin does not pick up any of the signals her mom is laying down so, of course, Jay is very confused when Caitlin introduces herself as Liza’s daughter. He has follow-up questions and he wants to meet with Liza later to discuss. We’ve seen rival editors try to use Liza’s secret against her (Martha Plimpton, we miss you! ), so Liza steels herself for whatever Jay may demand as payment for keeping her secret. The two have dinner at the Princeton Club and Liza lays it all out on the table. But surprise, surprise: Jay doesn’t want any part of blackmail. He’s one of the good guys, he says. And he’s a nerd for willingly using the phrase “one of the good guys,” he adds. Although my eyebrows were raised just as high as Liza’s, it seems like he really means it. Of course, he also advises Liza to keep her secret from her bosses to avoid a scandal — and to keep the premise of this show alive and well. WE ALL THANK YOU, JAY. Speaking of bosses, who should walk right into the Princeton Club at that very moment? CHARLES. I know New York City can be a very small town, but it’s never smaller than it is on Younger. As it so happens, Jay and Charles went to school together, so Charles is startled to see Jay and Liza sitting together. Jay thinks he’s doing Liza a solid when he tells her boss that Charles doesn’t have to worry about Liza consorting with the enemy. No, this dinner is purely social. IF YOU CATCH HIS DRIFT. The last time Charles saw Jay, he was dating a much younger woman, so he assures Liza that this run-in is only helping her cause. Oh, sweet Jay. If only you knew the damage you were doing. Charles is bothered. But this terrible birthday doesn’t rest solely on Liza. The bigger blow might actually come from Kelsey. Millennial’s labradoodle book Pearls of Wisdom, bred from blackmail from that Entertainment Weekly writer, is a surprise smash hit due to Liza’s rewrites, some excellent merchandising, and a dog merkin. Can we never talk of dog merkins again? Much appreciated. Anyway, Charles is thrilled that Millennial is raking in the dough. It’ll be especially helpful as they go into negotiations with L.L. Moore, who, as we know, is basically keeping the lights on at Empirical. Unfortunately, with great sales comes some hard-core ribbing from Kelsey’s new boyfriend and rival from Rivington, Zane Anders. He and Kelsey enter into what the kids refer to these days as “a Twitter feud.” To the two participants, it is merely playful foreplay. The feud goes national, and Charles warns Kelsey against letting this play out publicly. The Millennial team gets word that L.L. Moore has signed with Rivington. When Charles and Diana find out that Kelsey and Zane are more than just Twitter rivals, Charles explodes at Kelsey for her carelessness. This is bad. No one wants a DILF to be disappointed in them. Kelsey is beside herself for messing up. She tells off Zane, who texts her that this isn’t what it looks like, but she’s too upset to follow up. Kelsey is in serious danger of losing her job. Liza doesn’t like watching her friend suffer, so she marches into Charles’s office to give him a piece of her mind. But Charles is fuming. When Liza says that it’s unlike him to react so strongly without knowing all the facts, Charles replies that she’s right — he doesn’t know anything. He doesn’t know how he’s going to replace his top-earning author. He doesn’t know how he’s going to make payroll next month. And he doesn’t know how Liza is dating a 40-something guy in publishing who isn’t him. Liza’s jaw drops. Charles stands there in shock at what he just let slip. But before anyone can say anything more, Diana walks in with that goddamn birthday cupcake to put an end to the moment. All we can do is wait. Okay, we can also squeal. There was a lot of squealing coming from my couch. • Diana’s tirade about dressing up for Charles (and to keep office morale up), but realizing she is casting her “pearls before swine” is an instant classic. But seriously, she won’t stop with the fabulous outfits, right? RIGHT? • When Kelsey gets outed for sleeping with the enemy, Diana warns her about the dangers of pillow talk. She begins to relay her own story about something similar that went down while at HarperCollins, but doesn’t finish. I would pay good money to hear the end of that story. Don’t hold out on us, Trout!